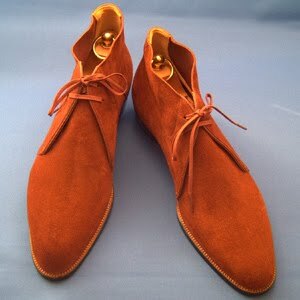 The brown suede dress chukka boot is the most versatile boot in existence. The one pictured above, by Koji Suzuki, is the perfect example. It’s color can be worn in all seasons and be complimented by pretty much every other color although I would hesitate to pair it with black but am not saying that it could not be done for I have seen some Italians pair a lighter brown shoe with black trousers or suit and it came out very well done. 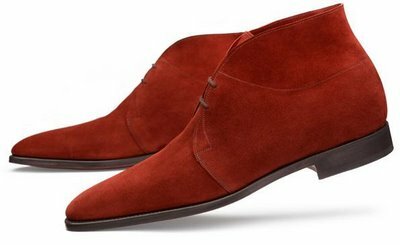 The only downfall to this model is that it seems to have a leather sole, not that I don’t like that but I believe that this same model with a rubber sole cut like a leather dress sole would add to it’s versatility. The rubber sole would allow you to wear more casual outfits with the boots as well as traverse across terrains that might not be so forgiving as pavement. The two pictures above are actually a pair that I own by Stefano Bemer with that dress rubber sole that I was talking about. These have served me very well and been worn for many different occasions. I have had them for over a year now and have put them through hell and back and have not even cleaned them one time. I have spilt wine on them several times and have used them for work where dust accumulated on them faster than you could say dust and yet they keep on going. This is where you thank quality for what it gives you. Sorry I began blabbing there. 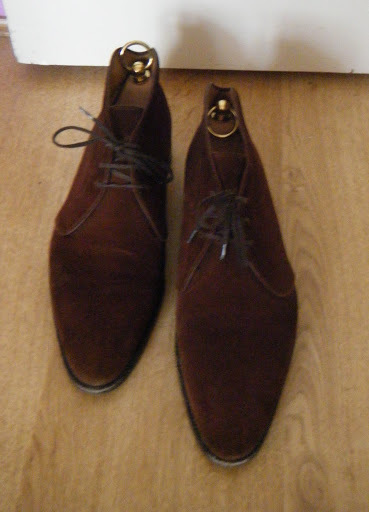 But anyway I have worn them with jeans, cords, suits, flat front trousers etc. and they go well with all of them, in fact there is not one of my pants that they don’t look good with. The amount of use that I have been able to create with my chukka boots has amazed me and this is why I really can’t see any other boot having more versatility than these. Of course, based on color preferences one might prefer a darker shade of brown but all in all this style takes the cake for most usable and best bang for your buck!! Below is the what my boots look like brand new and in a darker brown, again by Stefano Bemer. 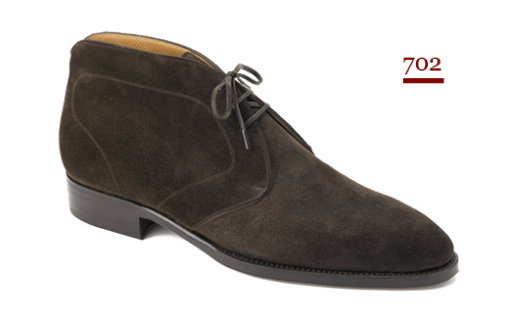 So if you don’t own a pair of dress chukka boots, preferably in suede, then go out and get a pair because your wardrobe is lacking considerably! thank you! they are very nice and I wish I owned them as well. You described them perfectly, "classic and stylish yet with a modern twist," my thoughts exactly! Les Freres JO' – Thanks!! Glad that you like the blog. I just checked out your blog and I really like the most recent outfit that you posted!! I will give it more of a look when I have some more time!-Justin, "The Shoe Snob"